Simon Kirwan Donaldson (born 20 August 1957, in Cambridge, England), is an English mathematician famous for his work on the topology of smooth (differentiable) four-dimensional manifolds. He is now a Chair in Pure Mathematics and President of the Institute for Mathematical Science at Imperial College London where he holds a professorship. 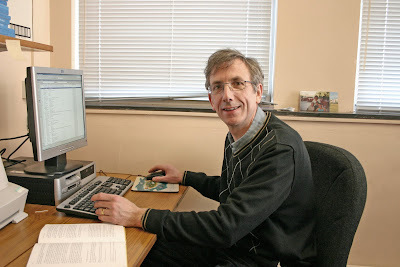 Donaldson gained a BA degree in mathematics from Pembroke College, Cambridge in 1979, and in 1980 began postgraduate work at Worcester College, Oxford, at first under Nigel Hitchin and later under Michael Atiyah's supervision. Still a graduate student, Donaldson soon proved in 1982 a result that would establish his fame. He published the result in a paper Self-dual connections and the topology of smooth 4-manifolds which appeared in 1983. In the words of Atiyah, the paper "stunned the mathematical world". Whereas Michael Freedman classified topological four-manifolds, Donaldson's work focused on four-manifolds admitting a differentiable structure, using instantons, a particular solution to the equations of Yang-Mills gauge theory which has its origin in quantum field theory. One of Donaldson's first results gave severe restrictions on the intersection form of a smooth four-manifold. As a consequence, a large class of the topological four-manifolds do not admit any smooth structure at all. Donaldson also derived polynomial invariants from gauge theory. These were new topological invariants sensitive to the underlying smooth structure of the four-manifold. They made it possible to deduce the existence of "exotic" smooth structures - certain topological four-manifolds could carry an infinite family of different smooth structures. After gaining his DPhil degree from Oxford University in 1983, Donaldson was appointed a Junior Research Fellow at All Souls College, Oxford, he spent the academic year 1983–84 at the Institute for Advanced Study in Princeton, and returned to Oxford as Wallis Professor of Mathematics in 1985. In 1999, he moved to Imperial College London. Donaldson received the Junior Whitehead Prize from the London Mathematical Society in 1985 and in the following year he was elected a Fellow of the Royal Society and, also in 1986, he received a Fields Medal. He was, however, turned down for fellowship of the Institute of Mathematics and its Applications on the grounds that he applied too soon after his doctorate. He was awarded the 1994 Crafoord Prize. In February 2006 Professor Donaldson was awarded the King Faisal International Prize for science for his work in pure mathematical theories linked to physics, which have helped in forming an understanding of the laws of matter at a subnuclear level. In April 2008, he was awarded the Nemmers Prize in Mathematics, one of the most prestigious mathematics prize awarded by Northwestern University. In 2009 he was awarded the Shaw Prize in Mathematics (jointly with Clifford Taubes) for their many brilliant contributions to geometry in 3 and 4 dimensions. The diagonalizability theorem (Donaldson 1983a, 1983b): if the intersection form of a smooth, closed, simply connected 4-manifold is positive- or negative-definite then it is diagonalizable over the integers. (The simple connectivity hypothesis has since been shown to be unnecessary using Seiberg-Witten theory.) This result is sometimes called Donaldson's theorem. A smooth h-cobordism between 4-manifolds need not be trivial (Donaldson 1987a). This contrasts with the situation in higher dimensions. A stable holomorphic vector bundle over a non-singular projective algebraic variety admits a Hermitian-Einstein metric (Donaldson 1987b). This was proved independently by Karen Uhlenbeck and Shing-Tung Yau (Uhlenbeck & Yau 1986). A non-singular, projective algebraic surface can only be diffeomorphic to the connected sum of two oriented 4-manifolds if one of them has negative-definite intersection form (Donaldson 1990). This was an early application of the Donaldson invariants (or instanton invariants). Donaldson's recent work centers on a difficult problem in complex differential geometry concerning a conjectural relationship between algebro-geometric "stability" conditions for smooth projective varieties and the existence of "optimal" Kähler metrics, typically those with constant scalar curvature. Definitive results have not yet been obtained, but substantial progress has been made (see for example Donaldson 2001). Donaldson, S. K. An application of gauge theory to four-dimensional topology. J. Differential Geom., 18, (1983), 279–315. Donaldson, S. K. Self-dual connections and the topology of smooth 4-manifolds. Bull. Amer. Math. Soc.. 8, (1983), 81–83. Donaldson, S. K. Irrationality and the h-cobordism conjecture. J. Differential Geom. 26 (1987), no. 1, 141–168. Donaldson, S. K. Infinite determinants, stable bundles and curvature. Duke Math. J. 54 (1987), no. 1, 231–247. Donaldson, S. K. Polynomial invariants for smooth four-manifolds. Topology 29 (1990), no. 3, 257–315. Donaldson, S. K. Lefschetz pencils on symplectic manifolds. J. Differential Geom. 53 (1999), no. 2, 205–236. Donaldson, S. K. Scalar curvature and projective embeddings. I. J. Differential Geom. 59 (2001), no. 3, 479–522. Donaldson, S. K. and Kronheimer, P. B. The geometry of four-manifolds. Oxford Mathematical Monographs, Oxford University Press, New York, (1990) ISBN 0-19-853553-8. Uhlenbeck, K.; Yau, S.-T. On the existence of Hermitian-Yang-Mills connections in stable vector bundles. Comm. Pure Appl. Math. 39 (1986), no. S, suppl., S257–S293. O'Connor, John J.; Robertson, Edmund F., "Simon Donaldson", MacTutor History of Mathematics archive, University of St Andrews, http://www-history.mcs.st-andrews.ac.uk/Biographies/Donaldson.html .